For this month's "Maps Of The Month" featurette, I wish to draw your attention to George s's Lady Stalker: The Apocalypse Engine (J) (Super NES) maps. Behold! The apocalypse is nigh! Lady, a mischievous young woman, travels the world looking for adventure. Followed by her gardener Yoshio and her chef Cox, she seeks out Deathland Island in search of treasure. But what about the titular Apocalypse Engine, a rumoured ancient device that supposedly transforms monsters into larger and more fearsome creatures? 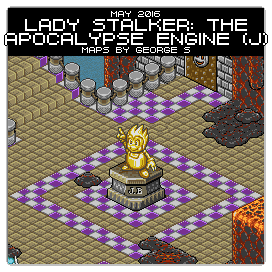 Also known as "Lady Stalker: Challenge From The Past", The Apocalypse Engine is the sequel to the Genesis game, Landstalker: The Treasures Of King Nole, which George s also mapped, and was featured in the Maps Of The Month featurette last April! Like the console libraries they belong to, this Super Famicom sequel is more RPG-like (with random battles) than its Genesis predecessor. But both games are isometric, which make great-looking maps - and incredibly useful, as it's easy to get lost when you deal with three dimensions instead of the usual two! You'll travel across typical idyllic grassy landscapes, to labyrinthine mines and towers. But there are of course some interesting and unique areas too, like when you shrink and fight atop a monster's body while he's taking a nap! So to recognize the effort put into taking on this Japanese-only "Challenge From The Past", George s's Lady Stalker: The Apocalypse Engine (J) (Super NES) maps will be known as VGMaps.com's Maps Of The Month for May 2016. George s made an awesome job mapping both games, especially given how difficult isometric games tend to be on that front. The more complex areas are connected in all sorts of non-intuitive ways and it's a miracle that he managed to make them look are comprehensible as they are. I would have given up much earlier if I'd been trying to map it. Also, I want to remark on just how much more interesting these maps are compared to the Landstalker ones. The mine area in particular with the rail tracks going around the mountain in multiple ways is especially stunning visually. It also seems to have more "verticality" in general too which is nice to see and rather rare in isometric games. Let's hope we see more from him! Thanks for the complement but I just want to say that if it wasn't for my brother's help (for making the cheat codes to access the howl map) I would not have been able to make the maps look this good. So... he gets some of the credit. I've never heard of the game before, but looking at the isometric maps makes me really happy. Great job at mapping it!